The NY Giants are moving money one way or another. Eli restructured his contract to move $6.75 million off this years cap. 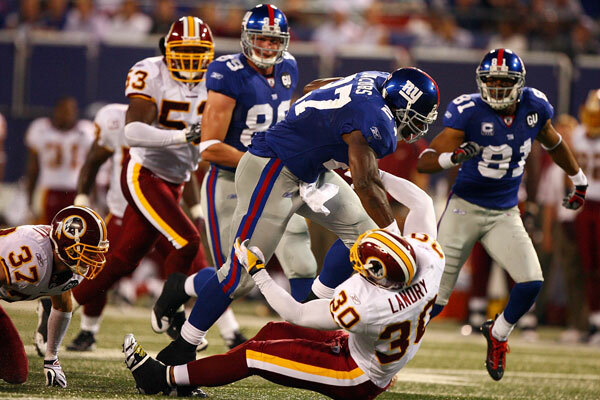 Now Brandon Jacobs was released to free up $5.0 million. His total cap hit would have been $7 million due to signing, roster and work out bonuses plus salary of $4.9 million. 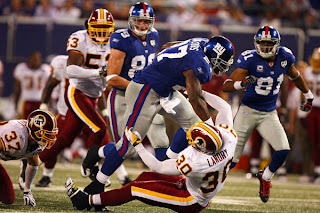 Brandon Jacobs will always be remembered by Big Blue DFW for leveling the Washington Redskins Safety LaRon Landry and hating the Dallas Cowboys (boy he hated that Stadium Play Clock). He was always super pumped up versus the Dallas Cowboys. Big Blue DFW, loved his leadership and hard nose attitude towards the Division rival here in Dallas, TX.